Help! 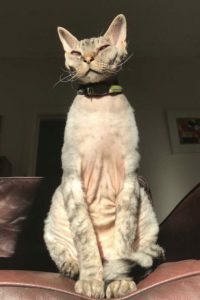 My Cat Is Losing Hair: Overgrooming or Stress? Hair loss is a good example of how the skin problems of cats are different from dogs. It’s got a lot to do with their special grooming behaviour. When cats have itchy skin they don’t scratch the same way dogs do. More commonly, they just lick the area more. This damages the hair shafts, which break, and bald spots appear. From the outside, the skin often looks normal. Once upon a time, at this point, vets would say, “your cat is overgrooming”. Boom. In one word, it’s suddenly the cat’s fault. But it gets worse. I once heard an eminent vet say that prednisolone has calming effects on cats and that’s why it works on ‘overgrooming’. Well, prednisolone is actually an anti-inflammatory steroid. Despite the fact that ‘pred’ could only be working by suppressing an itch, some vets were willing to invent new properties for the drug rather than accept the reality. As you can see, I don’t deny the existence of psychological overgrooming. It just needs it to be considered last. The reason is simple: the first two will get better with specific treatment. Overgrooming is a diagnosis of exclusion and often ends up being hard to treat. The mystery photo shows hair loss between the back legs of our elderly patient Purdy. It would have been so easy to call it psychological or hormonal. If we call a cat an overgroomer, we’re in danger of giving up on them before we start. We need to consider all three causes. Lets start with the itch. Now have a look at the picture at the start. 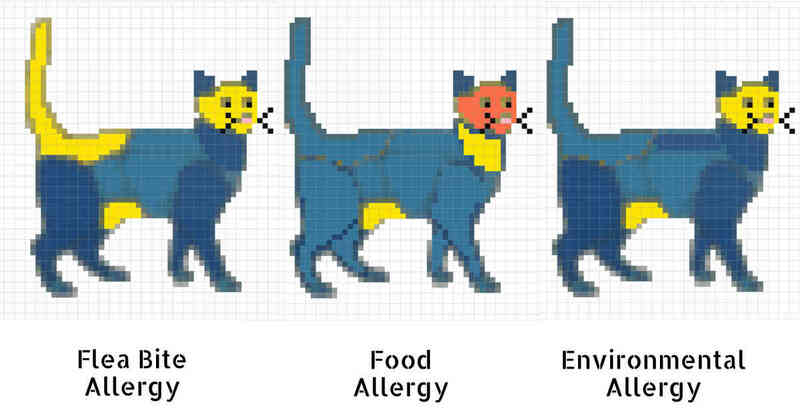 It shows the most common patterns seen for these three causes in 500 cats. The colours indicate the percentage of cats in each group that were affected in that area. Point 5 means that although patterns are useful to tell us what to try first, we can’t use them for a diagnosis. So what about the second cause of hair loss? What Causes The Hair To Fall Out? Not many diseases cause spontaneous alopecia. 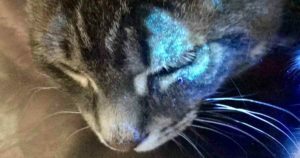 A fungal infection called ringworm (pictured under ultraviolet light) is most common. However, Purdy just doesn’t fit the age or pattern for ringworm, and the skin changes aren’t consistent either. Hair can also fall out with mites (very rare, wrong spot) and breed-related ‘disorders’. Pictured is my disorder of a Devon Rex, Grendel. All the rex breeds have hair that grows poorly and so most of them will have bald patches at times. That’s just the way they are. So, by exclusion, it seems like Purdy will be overgrooming after all. You can read more examples at our page on Stress and anxiety in cats. In this case, Purdy’s problem was caused by hyperthyroidism. She was brought to me for the hair loss, but I noticed she wasn’t right in other ways and ordered a blood test. Thyroid disease makes cats edgy and highly strung. Once we controlled her thyroid problem, she relaxed and the hair grew back. Do Hormones Cause Hair Loss in Cats? 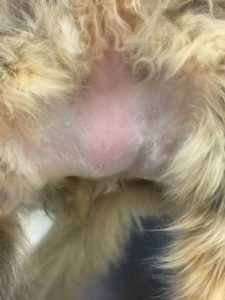 Hormonal causes come up online as the top cause for feline alopecia. Well, Google if you’re listening, the right answer is: almost never. Purdy’s example is an unusual way to recognise thyroid problems. I also see hair thinning with untreated diabetes, but that’s the least of these cats’ problems. And as for the major cause in older dogs, Cushing’s disease in cats is too rare to mention. So to finish, let’s get practical and imagine you’ve got a cat with bald spots. You now know it can be caused by a lot of things. What do you do? First, get a checkup with your vet. I’ve only discussed the common, typical causes of hair loss but your vet knows a lot more. After this, if you’re not getting improvement, talk to your vet. There are always other ideas such as ringworm culture or biopsy, or you may be recommended referral to a specialist. Good Evening, what do you suggest to treat dandruff? My 3 1/2 year old Burmese is an inside cat and has terrible dandruff. Her diet consists of Royal Canin, Neutered Young Female biscuits, raw chicken wings and beef cubes. Hi Alice. Dandruff usually has the same causes as hair loss, with particular emphasis on parasites. Therefore I would start with using Revolution and then see your vet for the other options. However, severe dandruff in cats is special in that it can also be caused by a LACK of grooming. Since you have a breed prone to dental problems, it’s worth considering even at such a young age.